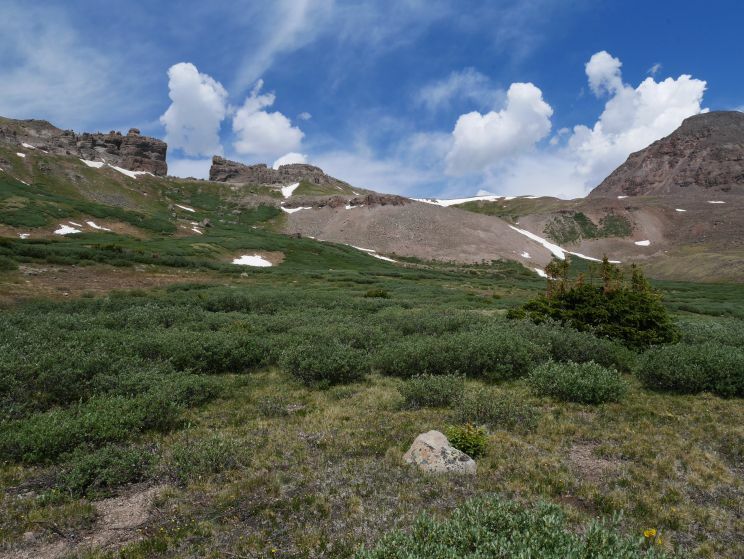 The Rio Grande Pyramid (RGP) is an iconic peak in the San Juan mountain range of south central Colorado. 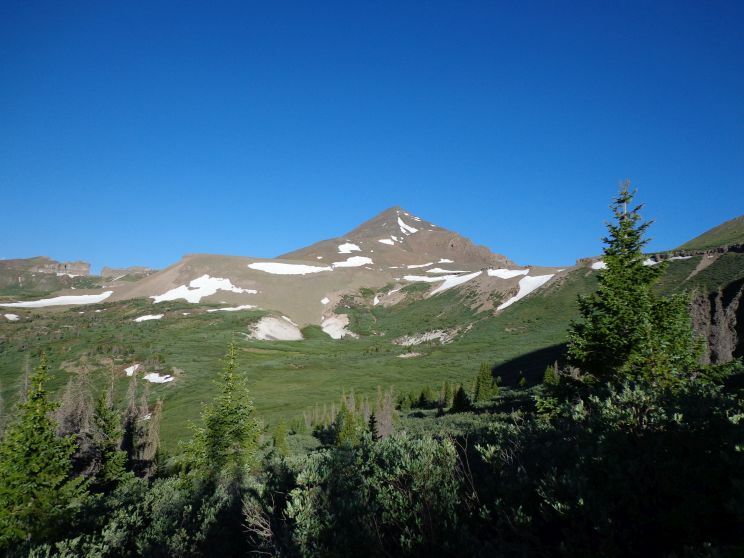 It lies deeep in the vast Weminuche Wilderness area along the Continental Divide. The mountain gets it's name from the pyramidal shape that can be seen from miles away. 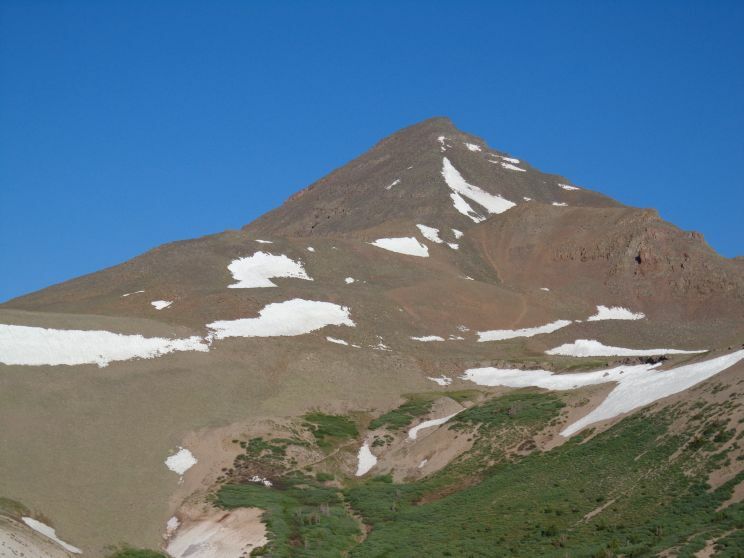 In fact, it is the sight of this mountain from several nearby 14ers that was the inspiration for this climb. 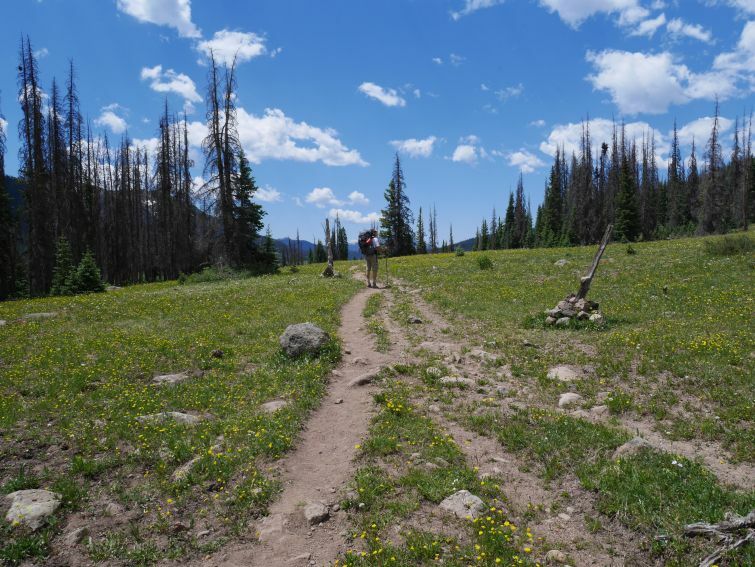 RGP is not technically difficult, but since it is located deep in the Weminuche Wilderness, the trek can be indimidating. The hike and climb is almost 20 miles round trip and it is far from civilization once you're back there. 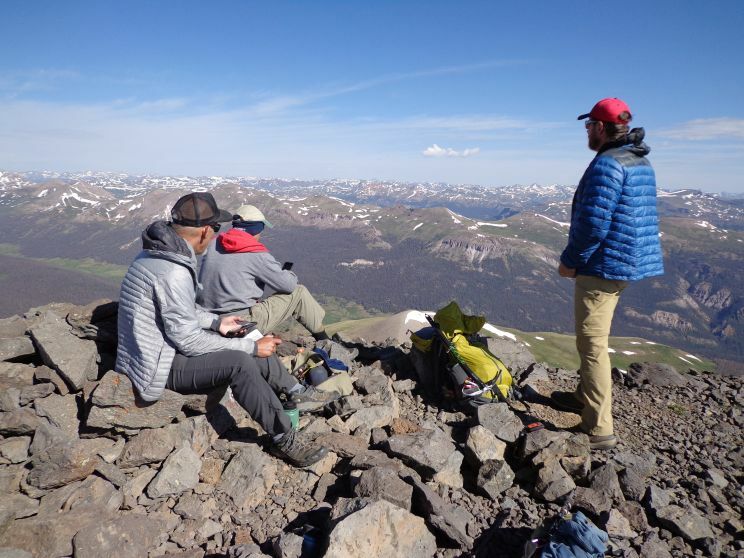 However, the rewards of this climb are solitude, spectacular views, and remote backcountry adventure. 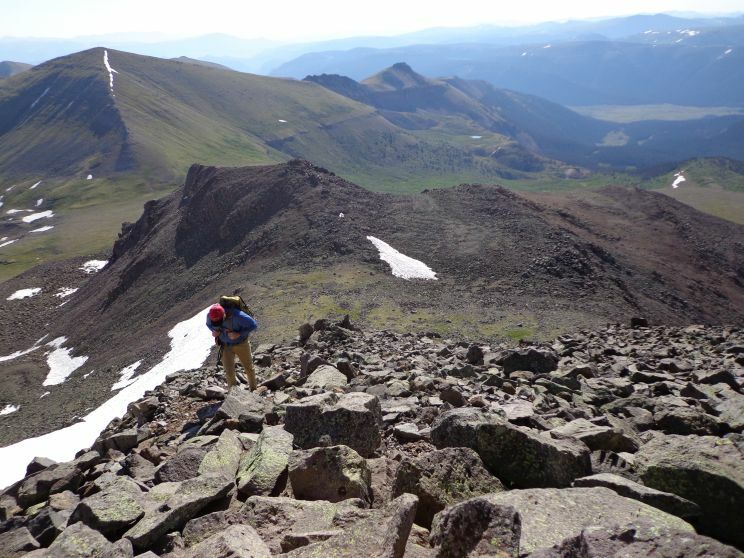 Rio Grande Pyramid is a fantastic backcountry trek and definitely worth the long hike to the summit. 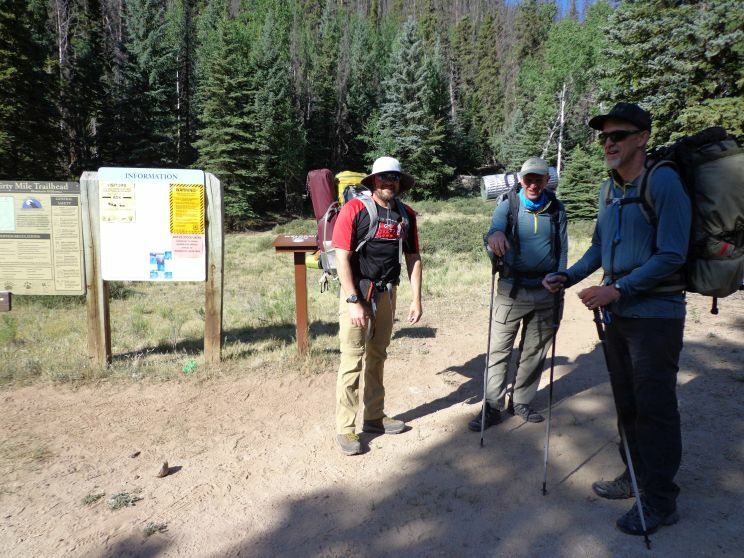 The journey begins at Thirty-Mile Campground near Creede, Colorado. Shortly after beginning the hike, we pass the Rio Grande Reservior before heading up into the mountains. After a long uphill hike from the lake, the first views of Weminuche Pass greet us. At Weminuche Pass, this cairn marks the turnoff to the west for the trail to RGP. 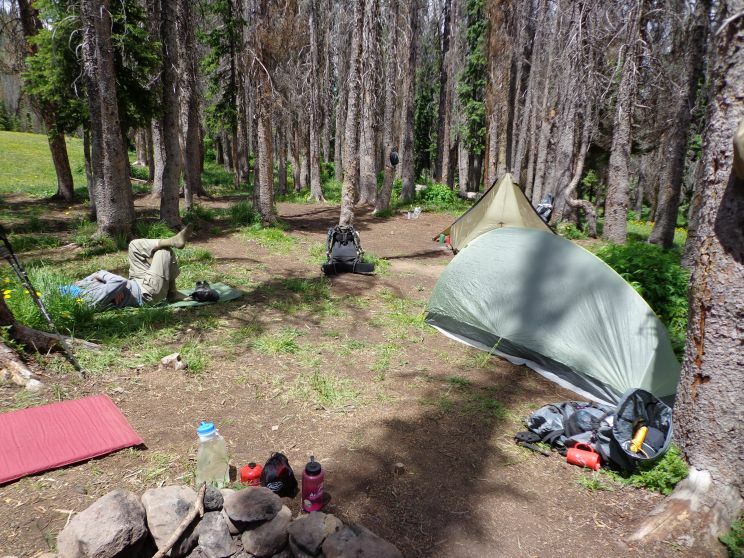 Great camping is at Weminuche Pass near the trail for RGP. It's about five miles from the trailhead and halfway to the mountain. Early the next morning, the sun rises on our first glimpse of Rio Grande Pyramid. The trail is fairly evident and contours around a ridge, staying high above the valley to the south. As we approach the mountain, the route becomes evident. 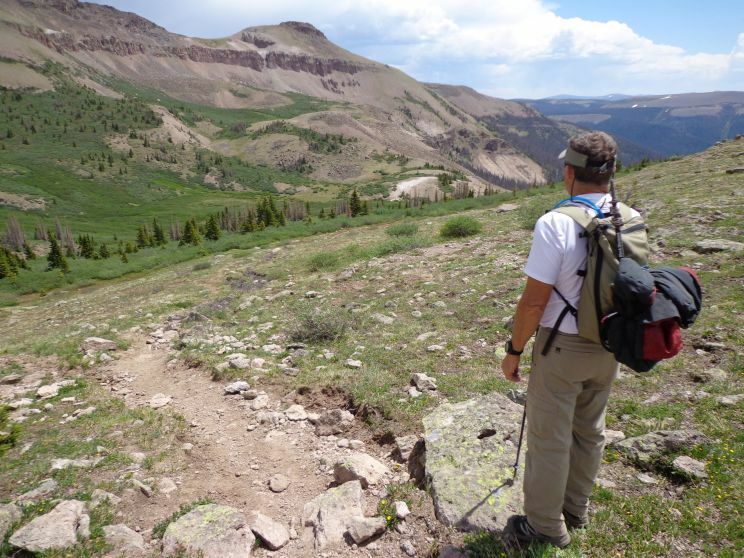 The trail is easy to follow until reaching the summit block. 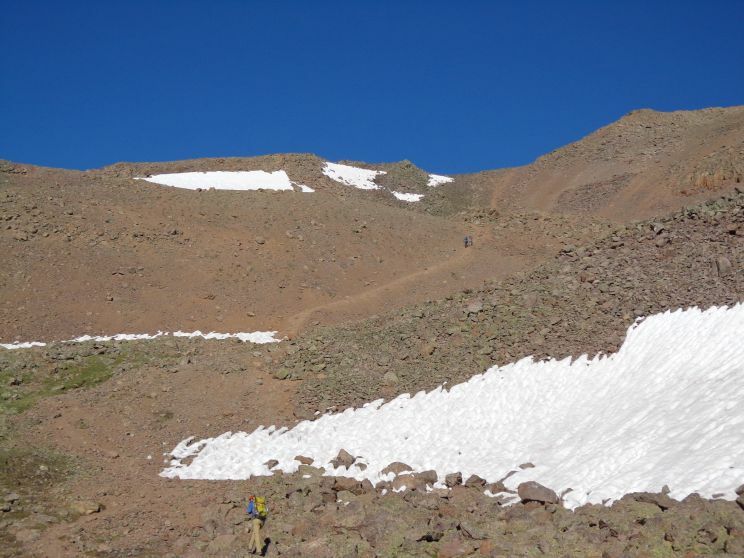 Closer look at the approach to the summit block with the trail still evident. 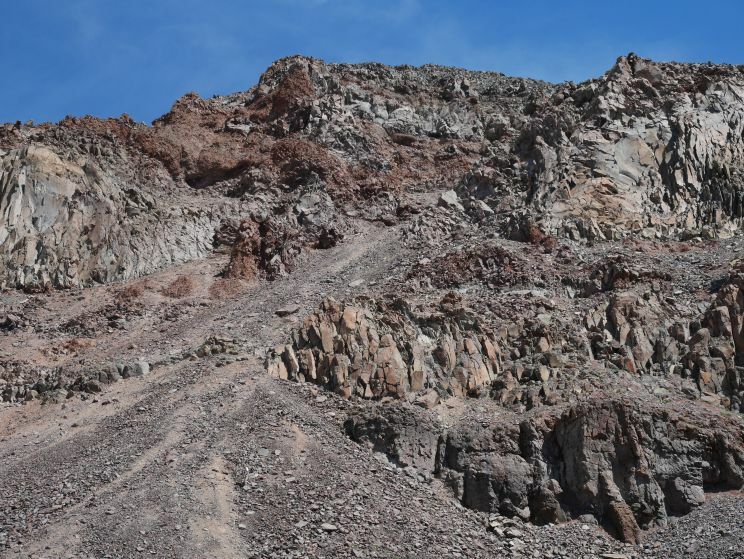 Near the summmit block, the trail deteriorates into a jumble of rocks and talus. 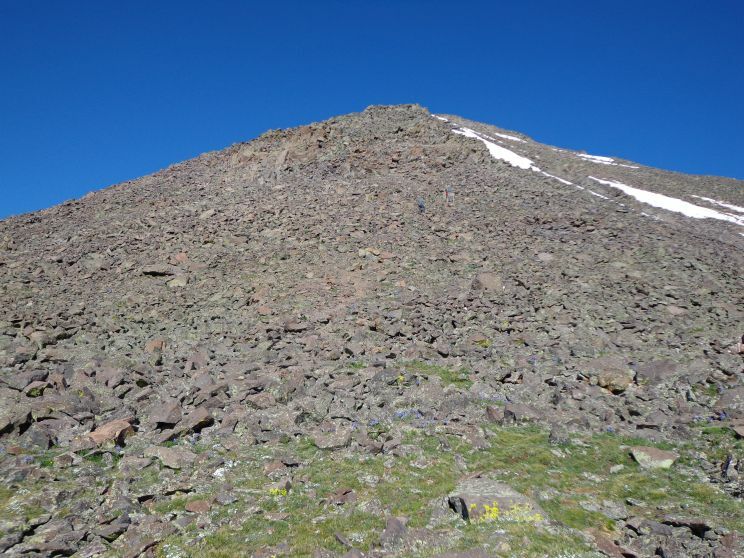 Occasional cairns and faint footpaths help guide the way to the summit. Obligatory summit shot. Great views of the San Juan mountins! We opted to descend a non-standard route via the south face as a shortcut to the Window formation. Word of warning: This is a bad idea. The south face is extremely loose and steep. Instead, retrace your descent to via the east ridge and descend to the Window just below the summit block. 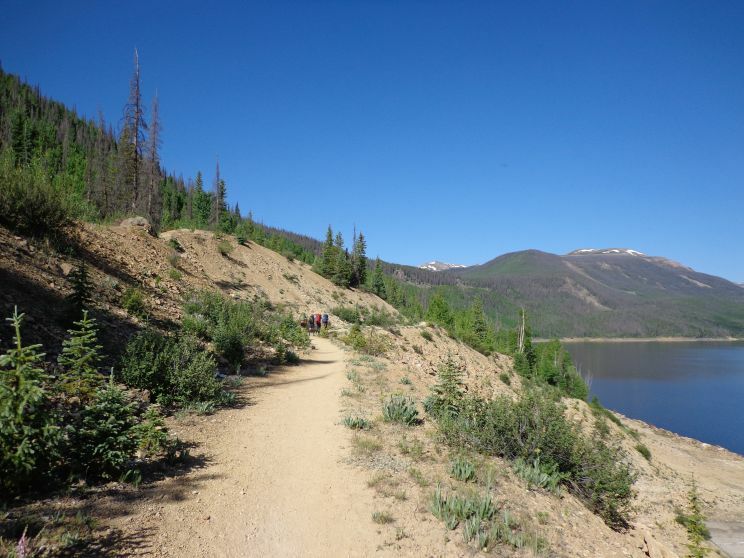 After the Window, hike along the Continental Divide trail until reaching the Weminuche Trail turn-off. This makes for a long day, but a great tour of the wilderness. The Rio Grande Pyramid is not easy to get to, but it's definitely worth it. 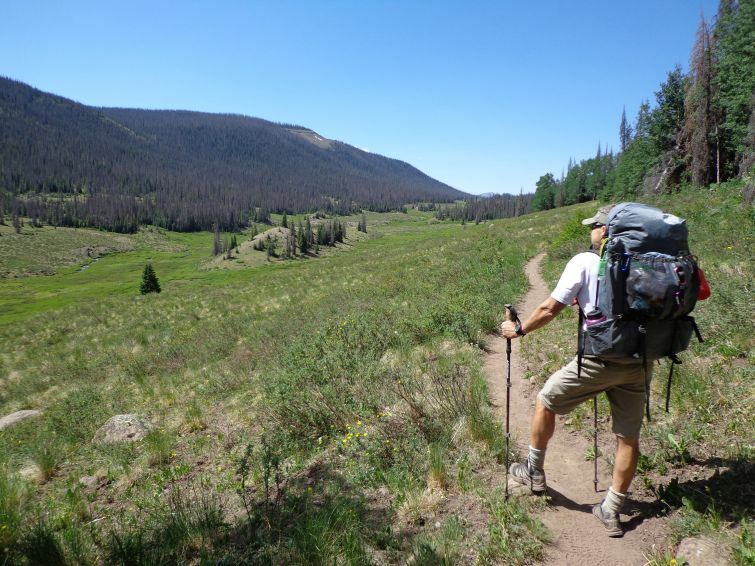 The mountain can be done as a long day hike, but a backpack is highly recommended to fully enjoy the trip. 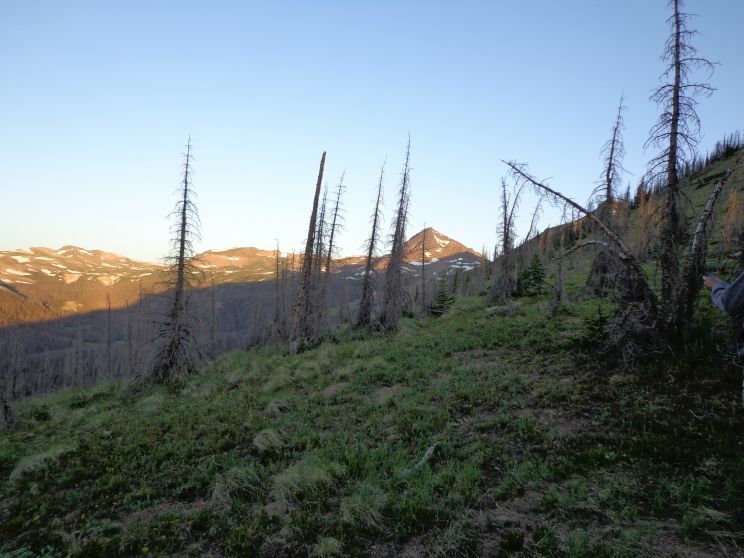 Start early to avoid the daily afternoon storms that frequent the Weminuche Wilderness in the summer months. Rio Grande Pyramid is a great trip and well worth the effort to get there. 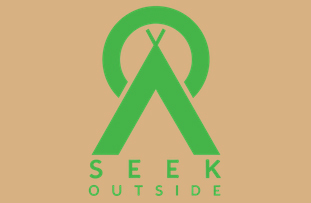 Thanks to Barry for use of his photos and to Seek Outside for the great equipment!